Apparently, you are not supposed to start a book review claiming that you love the book. I don't care. I've fallen hard for this story of Journey Wind Song and her community. 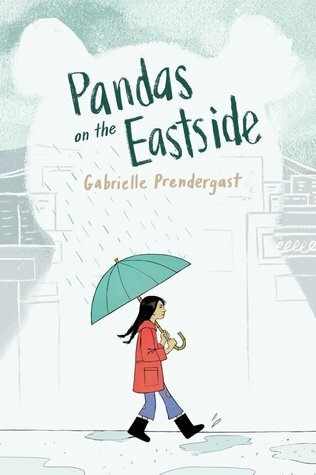 Pandas on the Eastside is undoubtedly one of the grooviest books I've read in ages. It's set in the early 1970's in the downtown eastside of Vancouver in an inner city area known to locals as The Projects. While this is quality historical fiction and the gift of pandas from China to the United States is real, this book becomes alternative reality with the imaginary stopover of the pandas here in Vancouver, BC. In the middle of coming to terms with the return of a father she has never met, Journey Wind Song, a ten year old precocious preteen, gets it into her head to make sure that these two pandas, who are being held in warehouse somewhere in East Vancouver, are being taken care of, and end up safely at their destination in a Washington Zoo. Prendergast captures the reality of the neighbourhood in the small details. On her way to her multicultural school, Journey sometimes has to "step over puddles of pee or worse things, but mostly the streets are quiet." At school, "Some kids at school don't even speak English. Some kids never bring lunch. Some kids only come to class once or twice a week, or they come late every day." Her remarkable teacher, Miss Bickerstaff, probably agrees with Journey that, "it must be hard to be a teacher on the Eastside." Gabrielle Prendergast has created a multicultural community of complex, authentic characters, just like the real people who lived and continue to live in the neighbourhood. Each chapter introduces us to meaningful people in Journey's life through her point of view. All of them are survivors. Her unconditional acceptance of them enables the rest of us to see them as human. We are reminded that the world is composed of complicated individuals with different strengths and challenges who are all, in their own way, groovy. Nancy, Journey's best friend, can't read English, but can decipher Chinese characters. Contrary Gary, who Journey tricks into doing things by telling him to do the opposite, has mental health issues. Mr Huang, the owner of the corner store can be grumpy, but has a heart so soft he gives neighbourhood kids donuts for free. Kentucky Jack is a local alcoholic who the girls protect. Kelly Rae is a fifteen year old 'working girl' who Journey's mother describes as, "a good girl in a bad situation." Sweetness and humour infuse this book. David Shuman and his family, owners of the fanciest house in the neighbourhood, are communists. Journey claims, "I didn't have a crush on David or anything. I mean, he is nice and smart, but he really likes radios and spy books, and I really like bugs and pirate books, so it would never work. But I sure did have a crush on David's house." At one point Journey gets into an altercation with a classmate, Michael Booker, who, Journey explains, "comes from a bad family, so it's only partly his fault. And I don't mean a poor family. All the kids at Eastside Elementary come from poor families, and that's no excuse to be mean. But Michael's family is bad. His father went to jail for punching a policeman, and his older brother is one of those people who sell things I'm not supposed to know about. His mother is a drinker, like mine, only she never goes to meetings and hardly ever leave the house. She throws things too, I've heard, although I'm not supposed to gossip, so that's all I'll say about that." Eventually Journey apologizes to her substitute teacher and class with this speech, "I'm sorry for using such a bad word and making a disturbance in class. There is no excuse for something like that. In a way, I was objectifying Michael with my oppressive judgemental gaze instead of valuing him as a human being." When Journey's father ogles a waitress, she tells him, "I don't like men who look at ladies like they are pictures on the wall, designed to be pretty and impress people." When her father asks where that came from, she replies, "Mom's consciousness-raising group." As a consequence of her advocacy for the pandas, Journey ends up in trouble with the Chinese consulate. While Journey's mother and father may be flawed characters, they have their daughter's best interests at heart, and do everything they can to support and protect her. You have to love a character like Journey, who after getting into trouble and ending up in the principal's office, reflects, "Mr. Hartnell looked at me in that grown-up way that makes me so mad sometimes. The look says, I understand you kids better than you know. But I was thinking that neither dad nor Mr. Hartnell could possibly understand me. I didn't even understand myself, and I lived inside me." Gabrielle Prendergast's book celebrates the emergence of a young activist, and the power in a group of people coming together to make a difference. I hope we get to read more about Journey in the future. In the meantime, I'm going to track down Prendergast's earlier works, Audacious and Capricious, and her new title, Zero Repeat Forever.